The ABX in-room germicidal C-UVC filtration/recirculation unit utilizes a hybrid of biological and physical filtration systems to remove bacteria, fungi and viruses from the air. Its key biocidal technology is a solidstate germicidal irradiation system which provides simultaneous physical filtration and irradiation of highvolume air flow. The system utilizes C-band ultraviolet light (UV-C) at a 254 nm wavelength diffused into a solid media which is gas and radiation permeable. While organisms are slowed or trapped in the solid media, they are inactivated by the internal UV-C dosage (Figure 1). and bacterial colony-forming units when deployed in active ORs. 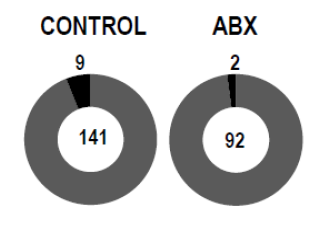 The implementation of ABX technology in active orthopedic OR performing spinal and joint replacement surgical procedures reduced SSI incidence by 66% (Figure 2). Figure 2. Decreased incidence of surgical site infections following the implementation of ABX technology in active orthopaedic ORs. CENTER – total number of cases observed; PERIPHERY – number of surgical site infections. 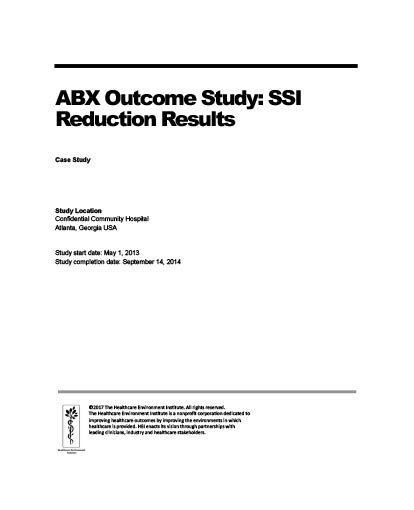 The 66% decrease in SSI rate over the 5-month ABX technology implementation period.